I wanted to participate in the Indie Design Gift-A-Long this year to show support for all of the talented indie designers who share their patterns with us. When I saw the list of patterns that were eligible included the Sweet and Simple Cushion, I raided my daughter's stash for some super bulky, Tahki, Sweet Montana yarn wool yarn she purchased while we were on a trip two summers ago. 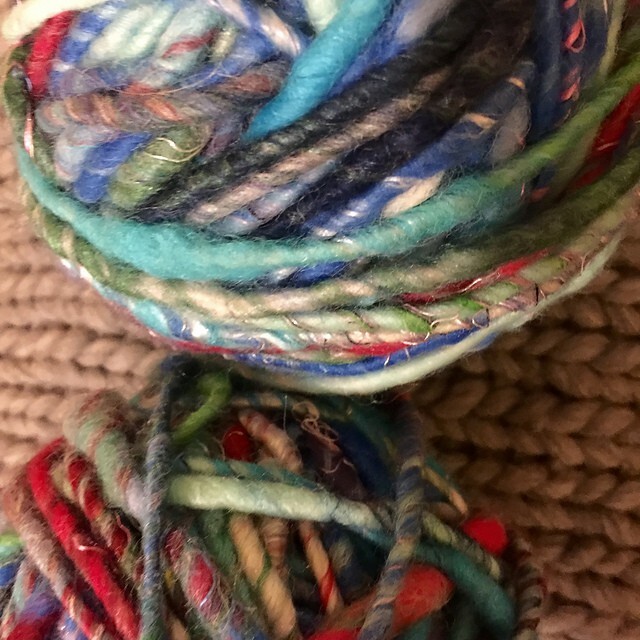 Perfect yarn for a fast, easy cushion. 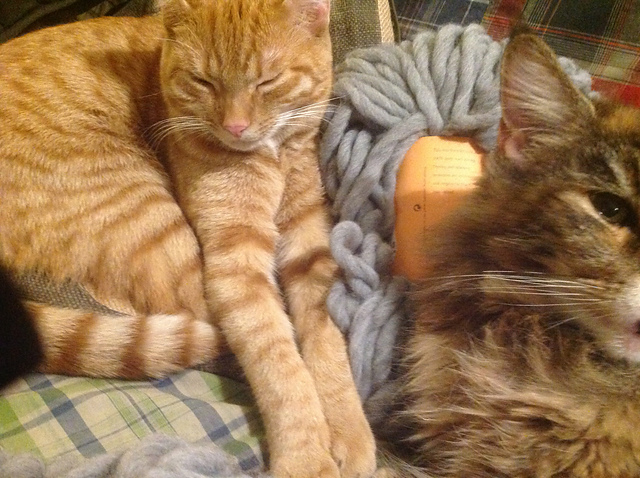 (I know the picture is mostly cats, but as soon as the yarn came out of stash and was living upstairs on the couch with me, it was clear it was one of those yarns that is so close to it's natural, sheep-y state that cats love it). I had an old cushion with a really lovely goose feather core, so I decided to discard the worn cover and upcycle it with a knitted cover. 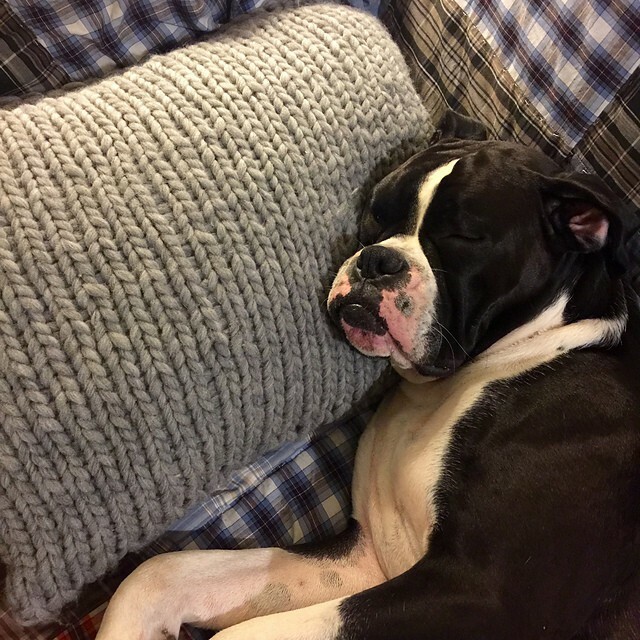 Miss Fig, my Boxer puppy, is every bit as happy with the results as the cats were with the yarn. I've got a bit of the gray leftover, and I'm so pleased with the cushion that I'm going to do a second one and stripe the gray with some think and thin handspun that incorporates Sari fabric. This is a great pattern, starting with a clever figure eight cast on that leads into one of the best patterns I've seen for mastering magic loop. Although I taught myself to do it several years ago for a project I didn't go forward with, I never use it. But here, it was such a logical way of knitting the cushion and so easy to do that I think I've become a convert. You can easily conform the pattern to any size with an easy gauge calculation or knit something more complex — I think I'll do one with the cable from my Big Cabled Afghan pattern incorporated into it, but you could do any sort of cable or even make a "Weasley Pillow" with an initial in the middle of it. The possibilities are endless and yet another great reason to support Indie Designers. The bundle of all of the eligible patterns is here and you have until December 31 to complete your project(s), so there is no reason to sit this one out!